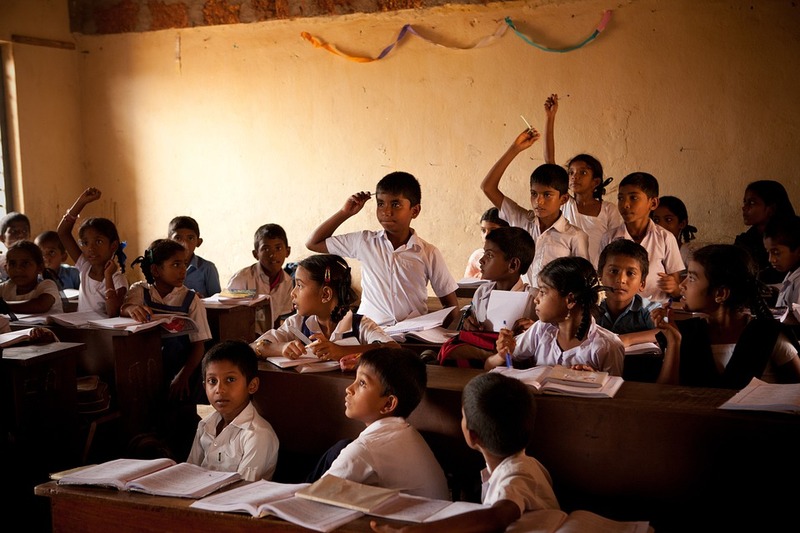 The number of children studying in English in India increased 273% between 2003 and 2011. But there is also a push for Hindi over regional dialects. Child development should be the guide, not politics or status. DEHRADUN — On Saturday, the kids who live upstairs from me got their "results." "What are 'results'?" Lakshi asked. "How you did on your papers," her Mom explained. Vijay — no surprise — was first in his class and his teacher's darling. "Such a smart boy," she said enthusiastically. "He knows all the answers." Lakshi, on the other hand, got a card full of red marks and zeroes and a rueful, disappointed teacher. Lakshi attends school in English, but she speaks, thinks and dreams in Hindi. At home, she is confident, articulate and smart — the life of the party. At school, she is quiet, nervous and withdrawn, never quite sure what is going on. Lakshi is not alone. Across India, battles are being waged around Hindi versus regional languages versus English as the medium of instruction in schools. Even recently, when the new ruling party in Karnataka proposed teaching in English in government schools, there was fierce opposition from all sections of society. This is nothing new. The debate around the issue of the medium of instruction in India goes as far back as the 1880s. British Imperialists argued over how their economic and political objectives would be better served — English or native tongue? — while freedom fighters locked horns over which language would better serve the cause of national unity. Of late, the issue has come down to nationalism and pride. Hindi has achieved the same ridiculous status here as English in Donald Trump's America: the language of the ruling class is the language of power and privilege and knowledge of it is as much a test of intelligence and worthiness as a mark of status. As far as I know, no one has brought a child development focus to the debate. So let's go back to Lakshi. Let's look at this issue through her eyes. When she visits me in the evening, wanting to help, we chat in Hindi with a few English words and phrases thrown in. I ask her to set the table and she knows exactly where everything is in our kitchen and exactly how it should all be laid out on the table — plates in the center, forks on the left, knives on the right, spoons to the right of the knives, glass positioned just over the tip of the knife. (These are all pre-reading skills, folks! Kids learn about order and matching when things are kept neatly in the right place, like with like; they learn about the difference between a lower-case "d" and a lower-case "b" by real life practice — the fork goes on the left, the knife on the right). Lakshi helps whenever I make a cake — she can pour, divide, measure and subtract. Once that cake is baked and served, she knows who got the bigger piece and she can tell me in precise terms not only exactly how many slices are left but also how many people could get one (not as easy as it seems for kids trained in rote learning). Lakshi is three. Her vocabulary is a joy, her math skills are amazing and her powers of observation remarkable. Her Hindi speaking has not hampered any of this. But the school she attends is doing its best to stamp out her curiosity and creativity and make her feel stupid right out of the gate. The English language is one of its primary weapons. The English used in most Indian schools simply does not allow for any real learning to take place. According to the National University of Education, Planning and Administration, the number of children studying in English-medium schools in India increased by an astonishing 273% between 2003 and 2011. Their parents think they know exactly what they are doing and why: they believe that knowledge of English is key to job security and upward mobility, and they are convinced that their children's opportunities will increase in direct proportion to their English vocabularies. They are right, but they are also totally wrong. Knowing English helps a lot in getting a good job, but only if that English is meaningful, accompanied by understanding and fundamental knowledge in all the other things children go to school to learn. The English used in most Indian schools simply does not allow for any real learning to take place. The subject is complex and fascinating. Given India's linguistic diversity, the dream of a common language is quite powerful. And English seems to many the only solution. Yet the results so far are abysmal. In the 2009 Program for International Student Assessment (PISA), India scored 75th out of 77 countries. This is an overall indicator of how schools are performing and does not specifically implicate English as a culprit. PISA continues to rank countries around the world, but after its 2009 humiliation, India has refused to participate, citing cultural inappropriateness in the testing. Keeping its head in the sand is one approach. But India's primary education is notorious for its rote learning, poorly trained teachers and lack of funding (India spends only 2.6% of its GDP on education; China spends 4.1 and Brazil is more than double India's at 5.7). English as the language of instruction makes all of it worse — developmentally, it is a disaster. Consider school from the child's perspective. Like Lakshi, most kids are very young when they set off from home. For the first time in their lives, they have to cope in a strange environment for many hours with a large number of other children whom they do not know. They must sit still, be quiet and speak only on command. The teacher, who is also a stranger, expects children to master completely new concepts: reading and writing; addition and subtraction; photosynthesis; the difference between a city and state and country. All in a foreign language! Are we crazy? Other countries do not do this to their children. Go to China, France, Germany, the Netherlands or Spain — all countries where English is commonly mastered as a second language — and you will find primary education happening in the dominant language of the area. In 2016, the state of California voted by a large majority to restore bilingual education in its primary schools. At the moment, only about 17% of Indian children are in English medium schools. Current trends suggest that this figure will rise exponentially in the coming decade (Bihar saw a rise of 4700% in just five years). If the Hindu nationalists of RSS have their way, however, the entire country will switch to Hindi, including those whose mother tongue is Kannada, Konkani or Gujarati. While the research is clear that children learn best in their own mother tongues, there are other compelling arguments as well, particularly in India. Classrooms are only as good as their teachers — in India, in 2012, 91% of the teachers currently serving in both private and government schools were unable to pass a national eligibility test. With this level of incompetence, we still expect them to teach in a language they are likely weak in themselves. Are we crazy? Other countries do not do this to their children. I am American, and my Hindi is better than the average Indian teacher's English. Yet I would never presume to teach in Hindi. Teachers need to be ready to answer any question that might arise; they need to have stories to illustrate the concepts they are introducing, and if those do not work, they need to come up with something that does. Teaching is not about memorizing or reading out loud. It is complex, nuanced and constantly adapting. The language of instruction should simply be a vehicle, an effortless flow of grammar and words which everyone absorbs without having to puzzle it through for meaning and definition. Science, math and literacy are hard enough as it is without adding so many layers of complexity. The country needs its next generation of leaders to master their fundas thoroughly so they can go on to practice medicine, build bridges, put in plumbing and design solar lighting systems. And children can learn second, third and fourth languages all in good time. But that will happen only if those youngsters grow up loving language, not feeling threatened and judged by it. We need them to write poetry and songs and novels. We need them to feel proud of their mother tongues, not apologetic and ashamed as if their intelligence is based on how much English they know. Lakshi and her friends are waiting expectantly. They are eager to learn and their brains are hard-wired just for that. Are we going to fail her and an entire generation of India's young citizens? *Jo McGowan Chopra is an American-born writer. A mother of three, she has lived in India for the past 34 years with her Indian husband. She is the co-founder and director of the Latika Roy Foundation, a voluntary organization for children with disability in Dehradun.